Sometimes known as Lopt, Loki was the Norse fire god. He was the son of the giants Farbauti and Laufey, and he became Odin’s blood brother. His main role was that of a trickster. He was clever and manipulative, a mischief-maker and a shape-shifter. He often caused trouble for the other gods, either on purpose or as a result of getting himself into a difficult situation, and sometimes risked serious harm to the other gods. Such was the case when, to avoid being killed by the giant Thiazi, he agreed to bring the goddess Idunn and her apples of youth to the giant. Without these, the gods began to grow old and frail, until they figured out what had happened and made Loki retrieve Idunn and the apples. Loki’s best friend among the gods was Thor, the tallest and strongest of the Aesir. He caused trouble for Thor, too, often trusting Thor’s strength and fighting prowess to save them both. When the giant Geirrod captured him and demanded an unarmed Thor delivered to him,in return for Loki’s life, Loki managed to convince Thor to leave his magical hammer and belt of strength behind and traveled with him to Geirrod’s house. However, along the way, a giantess lent Thor her own belt and staff, and when he and Loki arrived at Geirrod’s house,Thor made quick work of Geirrod and his two daughters. Another time, Loki provoked Thor’s rage by cutting off the long, golden hair of Thor’s wife Sif. Forced to produce a replacement, he traveled to the dwarves, and the sons of Ivaldi forged new hair made of gold for Sif, as well as the collapsible ship Skidbladnir for Freyr and the spear Gungnir for Odin. On the way back, Loki met the dwarves Brokk and Eitri,and showed off his gifts. Unable to resist a bet, he made a wager with them that they could not produce better gifts, and if they could, they could have his head. 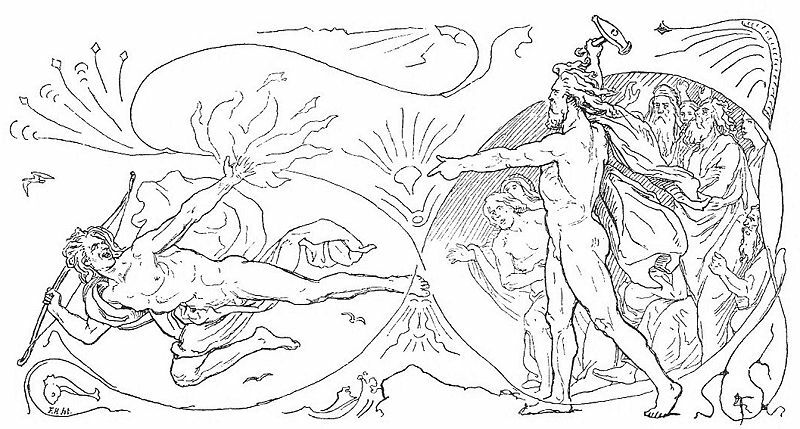 Despite Loki’s attempts to distract them, they made the magic ring Draupnir for Odin, a golden boar for Freyr, and the hammer Mjölnir for Thor. These were judged to be better than the gifts made by the sons of Ivaldi, but when Brokk and Eitri demanded Loki’s head, he told them that they could not have any part of his neck, and so they were unable to remove it. Instead, they sewed his lips shut as punishment. Loki’s cleverness and trickery were sometimes annoying, but could also be helpful, for example when he and Heimdall devised a scheme to get Thor’s hammer back when a giant stole it and demanded Freya in return. Thor dressed up as Freya and Loki as his bridesmaid,and it was Loki’s quick-witted answers and explanations that made the ruse successful. It was also Loki who persuaded the gods to take a man named Hrimthurs up on his offer to build a huge wall of ice around Asgard, in a single winter. 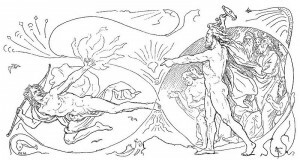 In return Hrimthurs wanted the sun, the moon, and Freya’s hand in marriage. Loki said that he would never complete the wall in such a short time, but Hrimthurs turned out to be a giant in disguise and had a magical stallion, Svadilfari, to help him. He made good time, and the gods became worried, especially Freya. To sabotage the bet, Loki turned himself into a mare to distract Svadilfari, and without his stallion, Hrimthurs’ work faltered so that by the end of the winter, there was still a small gap in the wall. 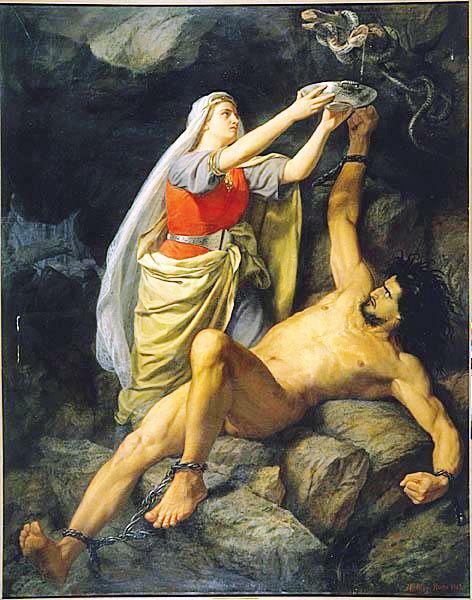 Hrimthurs grew angry at the sabotage and revealed his true form, only to be slain by Thor — the thunder god, once again, slaying the giant with whom Loki had gotten them involved, while Loki’s skill at deception saved Freya from an unwanted marriage.During his tryst with Svadilfari in the form of a mare, he became the mother of Sleipnir,Odin’s eight-legged horse. He also fathered three children with the giantess Angrboda: Fenrir, Jormungand, and Hel.Fenrir was a huge wolf who was so strong that every attempt by the gods to bind him failed;he snapped the first chain, Laeding, and the second one, Droma. The third one, Gleipnir, was magical and strong enough, but Fenrir refused to be bound by it until Tyr offered to put hisarm in the wolf’s mouth as a gesture of goodwill. When Fenrir was bound and realized that he could not break Gleipnir, he bit off Tyr’s arm, and at Ragnarok, he would break free of even that chain. Fenrir’s brother, Jormungand, was an enormous serpent who was cast into the sea by Odin. He was so large that he was able to surround the world of men, Midgard, completely, biting his own tail. He would only let go at the end of the world, when he was destined to kill Thor and be killed by him in turn. Finally, there was their sister Hel, a half-living, half-rotten woman. She was cast into the underworld by Odin, where she became the grim ruler of the dead. Loki later married Sigyn and had two sons with her, Vali and Narvi. He became progressively more evil as time went on. Initially he was just a trickster, as helpful as he was troublesome, but he grew more malicious, eventually going so far as to cause Balder’s death. He found out from Frigg that Balder could be killed by mistletoe, and gave Balder’s blind brother Hodr a dart made of that plant. When Hodr threw it at Balder, in the spirit of fun, the god was killed. The others knew that Loki was behind Balder’s death, so Loki was forced to flee. 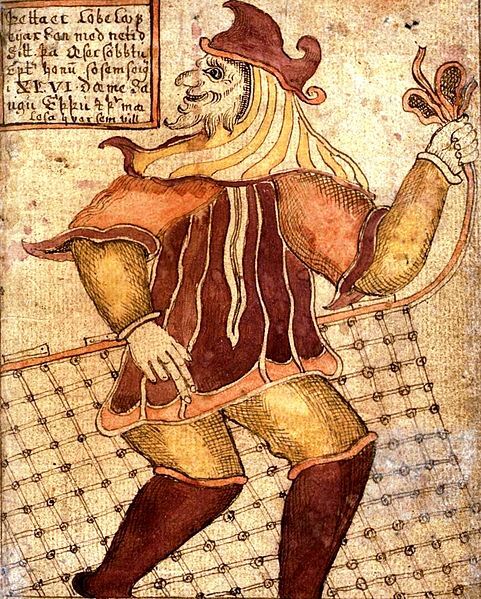 He turned into a salmon to escape, but Odin saw him, and the gods caught him in a net. Odin turned Loki’s son Vali into a wolf, and Vali immediately attacked and killed his brother Narvi. 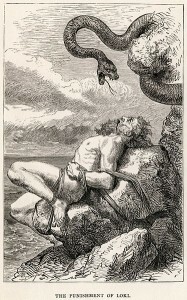 The gods then bound Loki to a rock in a cavern using Narvi’s intestines, and above him they tied a snake, which dripped venom onto him. His faithful wife Sigyn stood over him with a bowl and caught the venom. Whenever she left to empty the bowl and the venom splashed onto Loki, his agonized writhing caused earthquakes. He would lie there, bound, until Ragnarok, when he would lead the army of evil on the Vigrid plain. In that final battle, he and Heimdall were fated to kill each other.